Just as has been happening with mushrooms, well illustrated regional books about lichens are becoming more common. For anyone in the northeastern U.S. or southeastern Canada with a more than passing interest in these dual or tripartite organisms, this is a must-have volume. It covers the so-called “macrolichens,” which includes the leafy, fruticose, and squamulose species and excludes the crusts. Husband and wife Jim and Pat Hinds are life-long Northeasterners, currently living in Maine. Both have backgrounds in academic research, became interested in lichens as a rather serious avocation, and have been at it for over 40 years now. The front matter, which includes the preface, discussion of the illustrations, summary of the coverage, and the acknowledgments, is followed by over 70 pages of explanatory text covering a wide range of lichen topics. 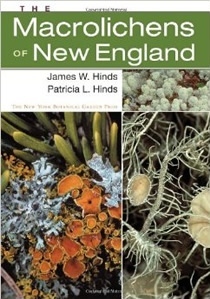 These include Morphology, Anatomy, and Reproduction of New England (NE) Macrolichens; Ecological Role of NE Lichens; Human Uses of NE Lichens; Biophysical Regions of NE and their Lichen Floras; Changes in Abundance and Distribution of NE Macrolichens during the Last 100 Years; Rare or Declining Macrolichens of NE; How to Collect and Identify Macrolichens; and Crustose Lichens of NE. This material goes beyond that typically included in a field-guide type of book (given its thickness [over 600 pages], weight [I estimate 3 lb or more], and hard cover, it would be hard to call this a field guide), addressing many interesting aspects of the lichens and the area in which they live. It is well written and the information is well researched, with many sources cited. This is followed by Introduction to the General Keys and the General Keys to NE Macrolichens. Rather than having one long key to over 500 species, the Hinds' chose to develop 50 short keys, usually based on readily observable characteristics such as substrate, growth form, color, and presence/absence of soredia and isidia (two types of vegetative reproductive propagules). A quick key index presented here and repeated inside the front cover is used to determine which of the 50 keys is appropriate for the lichen in hand. Getting familiar with this index and proficient in its use clearly will be important for achieving identification success. The leads in the 50 keys typically include macroscopic features, the usual lichen macrochemical reactions, and locational information. The keys include all 461 species recorded from New England, as well as another 41 that occur in neighboring states and possibly in New England as well. A nice feature is the yellow highlighting of names used to indicate the more common species (263 of them). Following an explanatory Introduction to Genus and Species Descriptions are over 400 pages of descriptions of nearly 100 macrolichen genera and over 450 species, including 86 cladonias(!). The descriptions are arranged alphabetically, first by genus and then by species epithet. Each genus description is followed by a key to the species in the genus. The species descriptions include the name with brief authority, an English name, reference to its illustration(s) (in other books if not included here), synonyms, indication of any misapplied name(s), the descriptive information including chemical reactions, range and habitat, and miscellaneous notes, which usually consist of a sentence or two. Just over 300 of the species are illustrated with a decent-sized, very-good-quality color photo. Most of them are of fairly generous size (up to ~4.5 inches long dimension). The book concludes with Literature Cited (19 pages), Abbreviations, Glossary, two Appendices (Key to the Major Photobionts in NE Macrolichens and Excluded Species), and separate indexes to Latin and English names. The production is of high quality throughout and the price is reasonable. As indicated at the outset, if you live or spend time in or near New England and are interested in knowing its lichen funga, this is a book you should own. But what if you already own the earlier gem, Lichens of North America by Brodo, Sharnoff, and Sharnoff (reviewed in the May-June 2002 Mycophile). After all, it is a rather comprehensive (and heavy!) volume with absolutely stunning photos. Well, the Hinds' book covers about 140 species that aren’t included in Brodo (other than a mention in comments in some cases) and there are photos for nearly 70 of these, so for the best coverage of the area, you need this book too. And, by the way, for those who don’t yet own it, having Brodo also will be valuable as it has photos of over 70 species that are described, but not illustrated, in Hinds and includes crustose species, not just macrolichens. In addition, approximately 240 species are illustrated in both books and having two photos helps one appreciate the variation within a species. Bottom line is you need both books if you’re serious about learning the New England lichens. This book review appeared in the September-October 2014 issue of The Mycophile.